Enjoyed by many for 450 years and breathtakingly beautiful in its elegant simplicity, Hyotei sweeps you away in the moment and takes you on a journey. 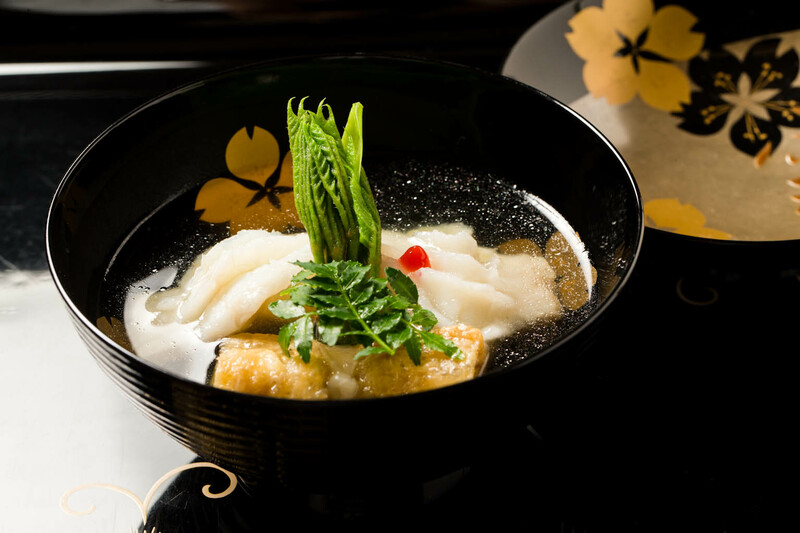 Kaiseki cuisine that weaves progress with the wisdom and traditions of many generations before, Hyotei offers haute cuisine fitting with these times – a simply unforgettable experience. Hugging the roadside is a wooden structure with café latte–colored stucco walls. 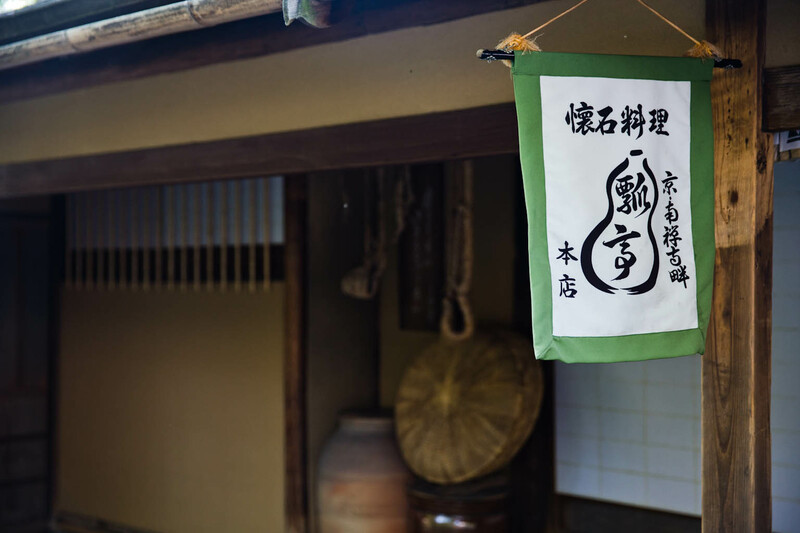 A simple hanging that wavers in the breeze depicts the curvy shape of a gourd, a Japanese symbol for happiness and success, within which are the characters for Hyotei. In vertical calligraphy, it simply says ‘kaiseki cuisine’. 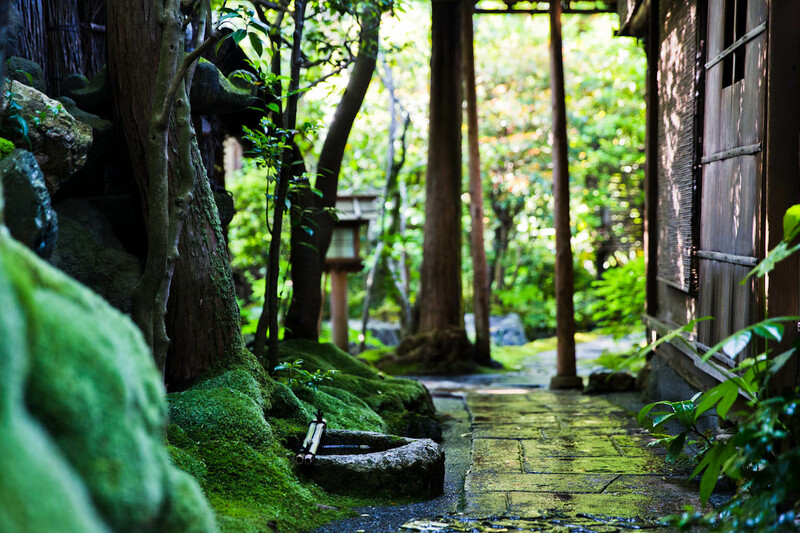 Narrow stone pathways connect the buildings, each constructed with traditional tea house aesthetics, and the rooms, holding two to thirty people, are all designed to serve as traditional tea rooms. There is no extravagance and no waste, just timeless simple beauty in scrupulously planned spaces. All modern accoutrements have been discreetly placed out of sight. 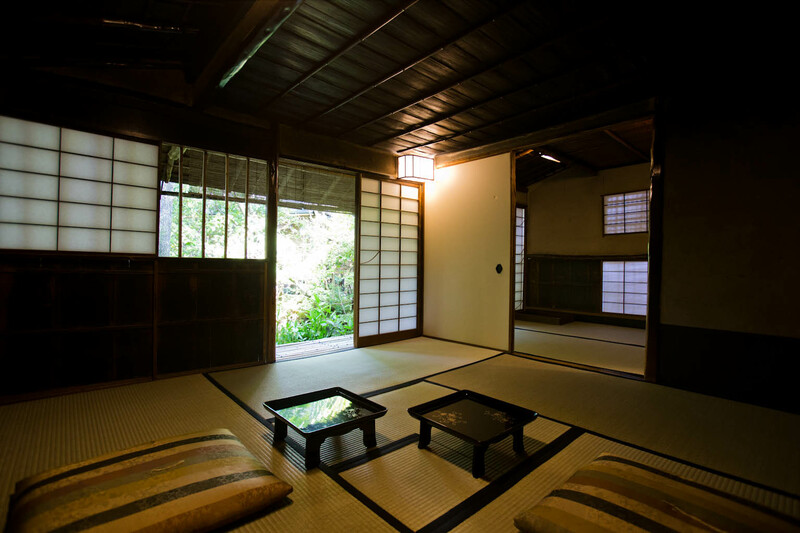 Paper sliding doors open onto tatami mat rooms with generous cushions and individual low tables on which the meal is presented in a series of incredible courses. The design, architecture and service all make you feel like the experience is exclusively yours. In the exquisite garden, a soft carpet of rich green moss tells the story of its long existence. It is carefully maintained by professional gardeners who meticulously prune it to preserve only the most desirable portions. Fish splash in the pond, water trickles through thin bamboo…the gentle pace allows you to breathe in all this beauty. Feel the history of 450 years. 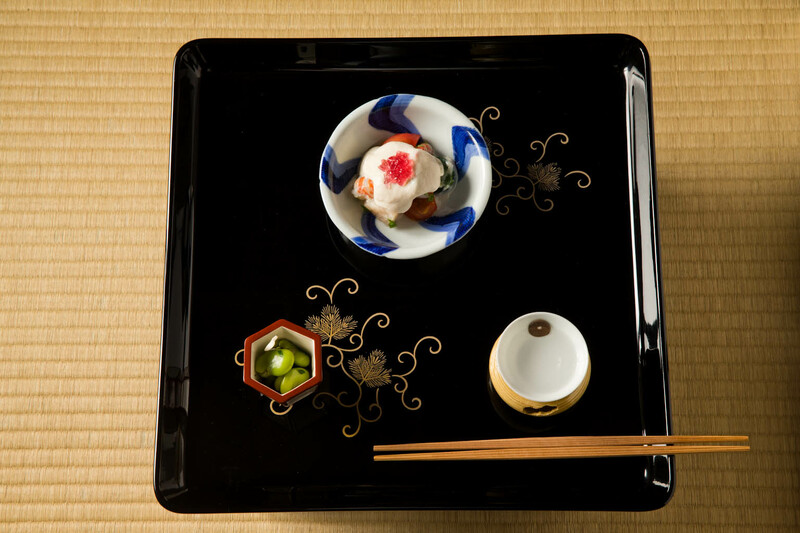 Respecting authentic flavors, simplicity and elegance above all else, it is no exaggeration to say that Hyotei is among the leaders of Kyoto cuisine. The underlying tenets of Kyoto cuisine include stimulating the appetite with wafting aromas and placing focus on the season through key ingredients and condiments. Add to that innovation layered over tradition, in the incredible ambience of a Japanese tea house setting, and Hyotei is an unforgettable dining experience. Chef Takahashi is confident that the Hyotei of today protects the 450-year-old traditions of Kyoto cuisine. However, while the course flow or plating may not have changed, what lies within certainly has. Constantly challenging the boundaries with new flavors and techniques – a dash of yuzu oil or a splash of tomato soy sauce – Hyotei remains relevant whilst respecting ancient traditions. 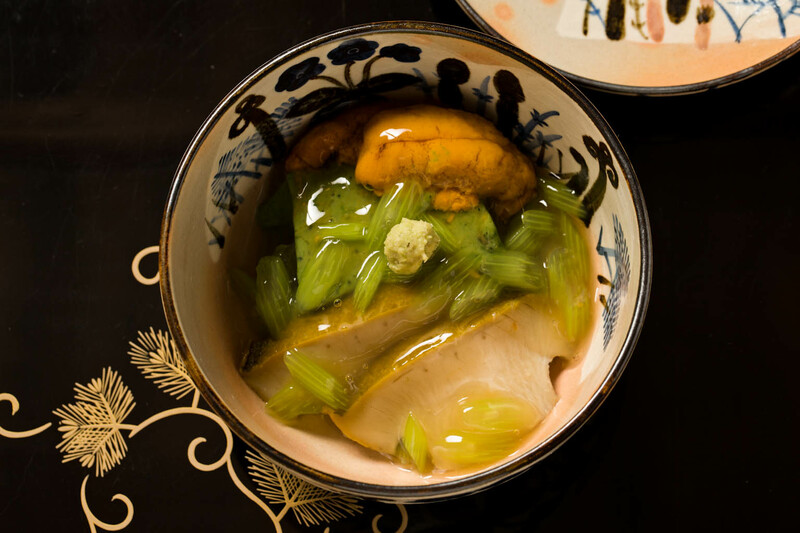 In the past, dashi, on which the flavors of Kyoto cuisine depend, was made solely from kombu kelp and bonito. These days, it may include tuna flakes or be entirely vegetable-based to cater to vegetarian customers – further proof of the chef’s forward thinking and flexibility. 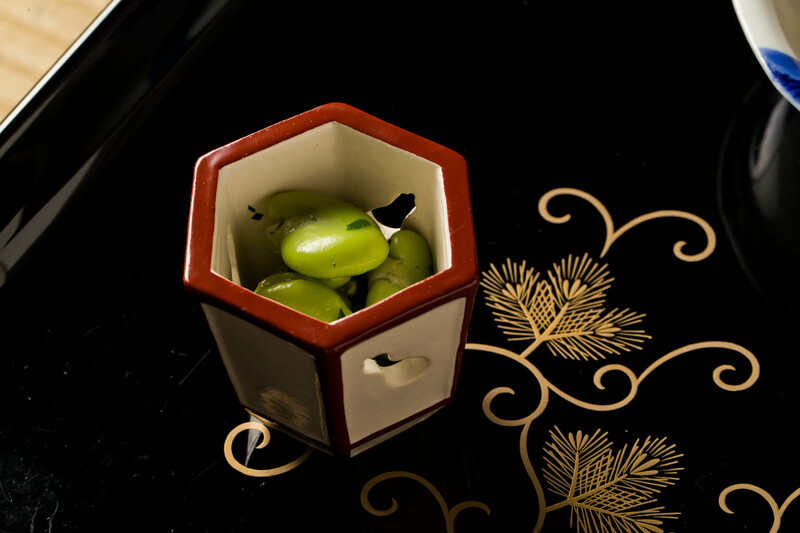 First to arrive is a colorful dish of large broad beans with sansho Japanese pepper buds, topped with the soft roe of sea bream. Hiding below is a tomato, bringing fresh acidity to the dish. 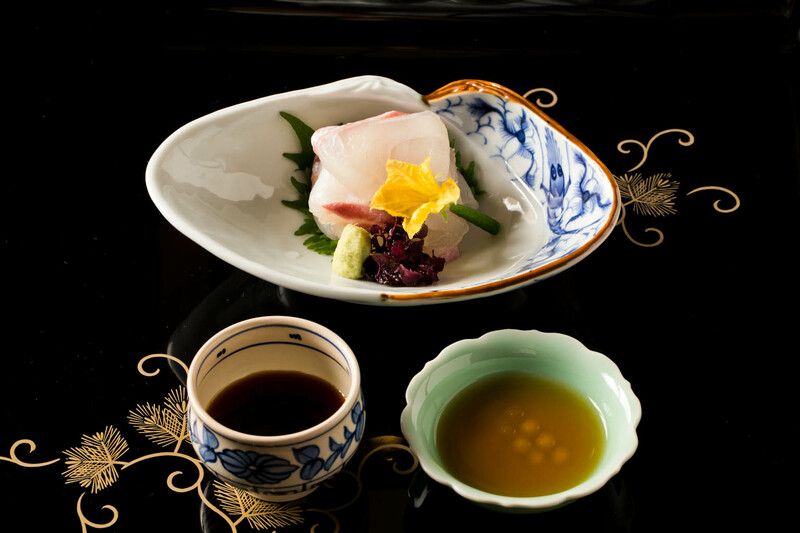 Akashidai sea bream sashimi is served with two varieties of dipping sauce – tomato soy sauce and Tosa soy sauce – leaving the flavor combination up to customers. 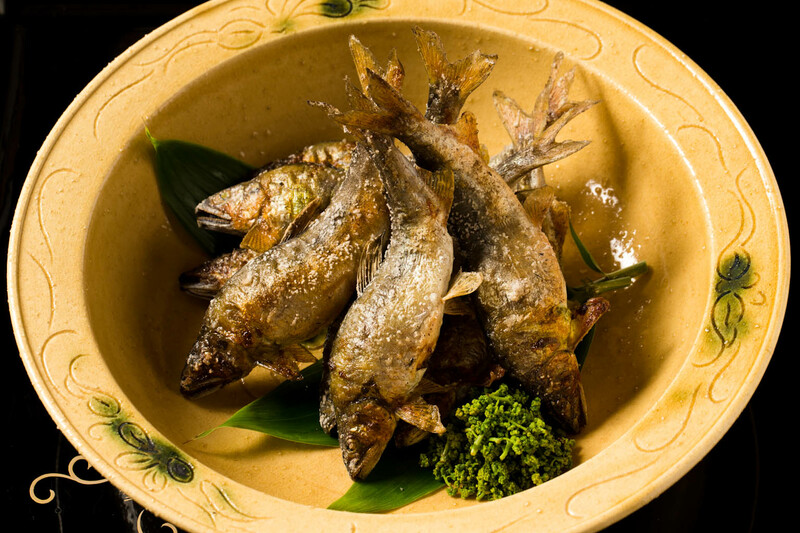 Fished in the Seto Inland Sea and prized for its delicious flesh, only female Akashidai between 1.8 and 2.5kg are served at Hyotei. 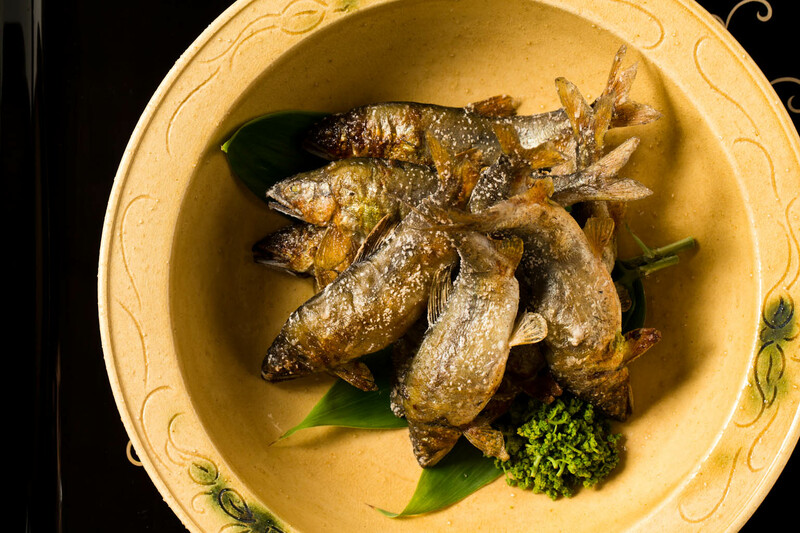 Soft fat greenling fished around Awaji is served with bluefin tuna dashi, followed by a bowl of small charcoal-grilled sweet river fish from Lake Biwa, Japan’s largest lake, in neighboring Shiga Prefecture. Here too, the zingy flavors of the sansho Japanese pepper tree feature in the form of the delicate flowers called hanazansho. 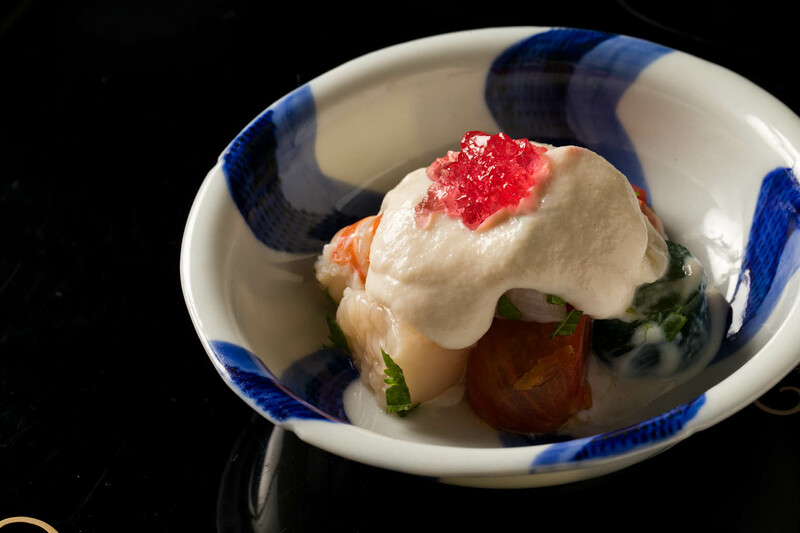 The next dish abounds with luxurious ingredients, and it is in this course that you can finally meet the signature dish: Hyotei Tamago. It is one enduring component and an important tradition that Hyotei wishes to never change. 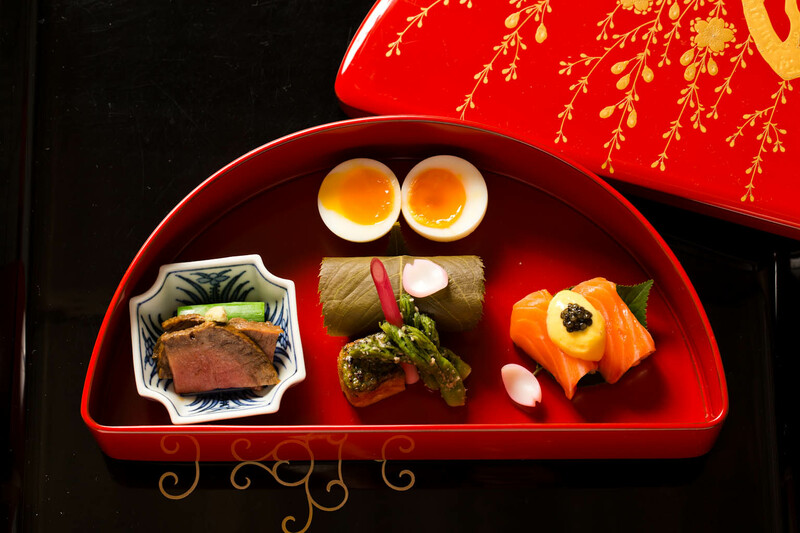 The specialty egg is served amongst a series of dishes including roast beef made from deliciously tender wagyu meat, sakura leaf sushi, awafu wheat gluten grilled with sweet and spicy sansho miso paste (dengaku style), and trout with egg yolk vinaigrette and caviar. Many other components are brought together in this dish, all topped with pretty pink lily bulb pieces, like petals fallen from a blossoming tree. Yomogi mugwort tofu, sea urchin, and abalone comes in a clear yet sumptuous butterbur sauce. 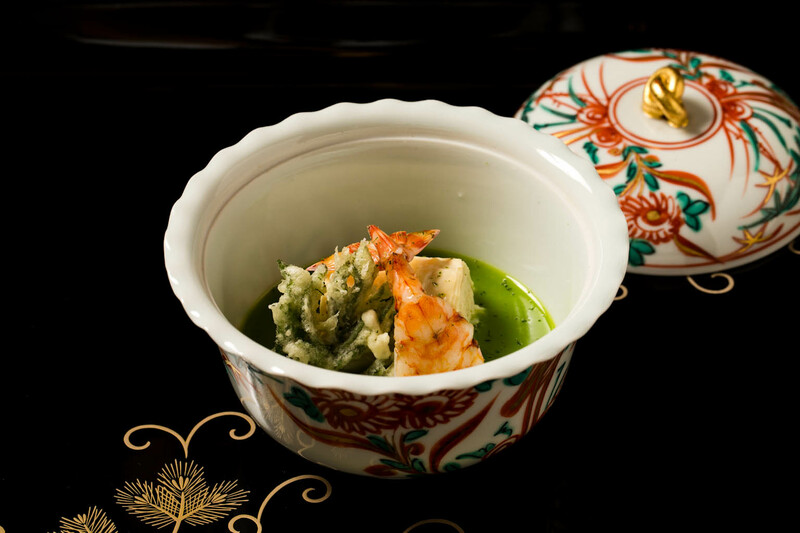 Velvety layers of yuba soy milk skin with char-grilled Japanese tiger prawn and the herbaceous plant udo sit within a soup made with vegetable dashi. Every course greets you with beautiful splashes of color and delicious authentic flavors. The meal is completed with a cup of green tea, bringing you back to the roots of kaiseki cuisine in Kyoto, and its deep interconnection with tea ceremony culture. The delectable dishes are served on Eiraku pottery, in lacquerware with its warming sheen, or in other pieces of tableware of unknown or unspeakable value. However, as if to remind us of why this experience is different to others you may have had before, Chef Takahashi tells us, it is not just about the food or the tableware – the delight of the experience is in the human interactions. Kyoto vegetables are known for their full flavor, but the ones served at Hyotei go even deeper. Ingredients are sourced through long-standing and trusted relationships with local farmers and fishers, especially in western Japan. Chef Takahashi regularly visits suppliers to see produce at its origin and maintain those crucial relationships, and the trips are a great source of inspiration for his cuisine. New ideas also come from welcoming other chefs and opening Hyotei to special events in which Takahashi personally participates. Born in 1974, Yoshihiro Takahashi is the 15th generation chef at Hyotei. As a child, the garden here was his playground and he sometimes fell into the pond as he fed the carp. He ate with his sisters in their adjacent home, waiting for their parents to finish work at the restaurant. The oldest son in the family, he was an extremely fussy eater as a child, constantly scolded for leaving food on his plate. It was not a promising start for someone destined for the culinary world, but he clearly was not put off by the experiences, writing in a short essay in third grade that he would one day take over the family business. Around the time he started junior high school, Takahashi started to help in the kitchen and cook for himself if he grew hungry. He left home for university in Tokyo, anxious to break from home and the town where everyone knew who he was. Studying management, joining the social tennis club and working part-time at a yakiniku restaurant, he was able to enjoy the typical student life before heading to Kanazawa to start his chef training. At the traditional Japanese restaurant Tsuruko, Takahashi trained for three years under the highly regarded head chef, before returning to Kyoto to join Hyotei. Home again, but with no special treatment, Takahashi was just another apprentice working hard to earn the respect of the master chef. Over the years, his own experiences have helped him realize just how amazing a chef his father is, and have exposed him to other ways and flavors, enabling him to see everything with so much more clarity. Takahashi plans to continue in his endeavor to fuse tradition with innovation. He hopes to please long-standing customers of Hyotei, while at the same time sharing his style with ever more customers from Japan and overseas. One day, he may even take his food out into the world. He is passionate about the goodness of Japanese, and in particular, Kyoto cuisine. And when you are passionate about something, you cannot stop expressing it – be it with words or through your creations. That is the key to success for Takahashi and Hyotei, and that is what makes his vision appear distinctly achievable. Hyotei had its beginning as a tea house adjacent to Nanzenji Temple, offering refreshment for pilgrims on their long journeys. It had no name, but weary travelers knew they could find replenishment here, particularly with the famous Hyotei Tamago. A tatami-matted seat from that time remains at the entrance today, inviting customers to sit down and relax. It’s incredible to imagine the stories and circumstances of the countless other people who have rested their legs in this exact spot. The calming serenity of the surroundings makes you forget where you are, and stepping through the entranceway is a step back in time. You are transported to a scene that feels so familiar even though you have never been here before. All five buildings that form the restaurant have been standing since the 16th century, some totally untouched, some with just minor structural changes over the years. They are all wooden buildings with stucco walls, some with charming thatched rooves. Fifteen generations of chefs have been carrying on the spirit of harmony, respect and tranquility exemplified in the Hyotei dining experience. 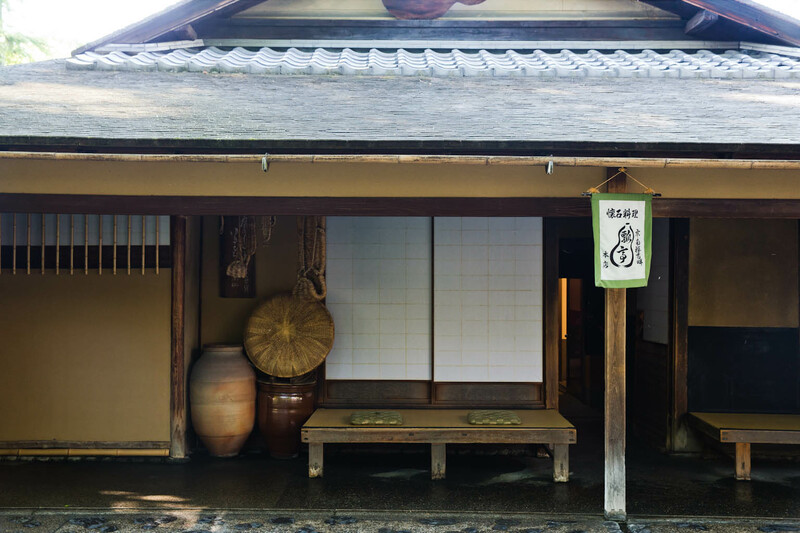 From the families who have been visiting for generations, to those who come for special occasions, and even once-off visitors, Hyotei sees all its guests as part of the tapestry of its deep and fascinating history.